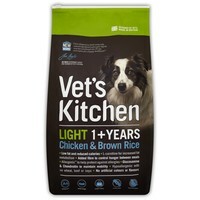 Vet’s Kitchen Light Adult Dog Food (Chicken & Brown Rice) is a complete diet that can be used in conjunction with a healthy exercise regime to help your dog achieve and maintain their ideal weight. Containing 20% less fat than standard adult diets in the range, Vet’s Kitchen Light has been made with high quality chicken to encourage lean muscle, L-Carnitine to promote fat breakdown, and increased fibre to reduce hunger. Vet’s Kitchen Adult Dog Food also contains natural glucosamine and chondroitin for joint maintenance, and live probiotics for healthy digestive functions.